New Approaches to Translation, Conflict and Memory is an interdisciplinary edited book by CTTS members, Dr Lucía Pintado Gutiérrez and Dr Alicia Castillo Villanueva. This book addresses foundational and complex issues, such as the role of translation in the transmission of conflict and the memory of the conflict. It will appeal to students and scholars of translation, history, literature and cultural studies. In conjunction with the School of Applied Language and Intercultural Studies (SALIS), CTTS members invite applications from prospective PhD candidates for full-time scholarships (worth 16,000€ per annum, subject to successful progression each academic year) to commence on 1 October 2018. The closing date for applications is 5pm (Irish Time) Monday, 28 May 2018. The EU’s Translation Centre is currently recruiting translators from French, German and Spanish into English. Title: Ergonomics in Translator and Interpreter Training. In the past few years, ergonomics has attracted a great deal of interest in Translation Studies. The most important reason for the sudden turn toward translation ergonomics is the profession’s susceptibility to computerisation. The ubiquity of technology in today’s translation practices places a serious strain on language service providers. Although virtually all translation tools and applications purport to make the lives of translators easier, relatively few programs are effectively geared to the needs of the translator. What is more, the monotony of working at a desk for hours and days at a stretch is bound to take its physical toll on translators. Apart from the cognitive and physical strains, concerns are being raised about social and organisational pressures that come with faster turnaround times, rapid globalisation and the ensuing growth of the translation industry. At the same time, cognitive, physical, and organisational pressures are also features of the interpreting profession, and increasing technologisation of interpreting workflows has been noted. 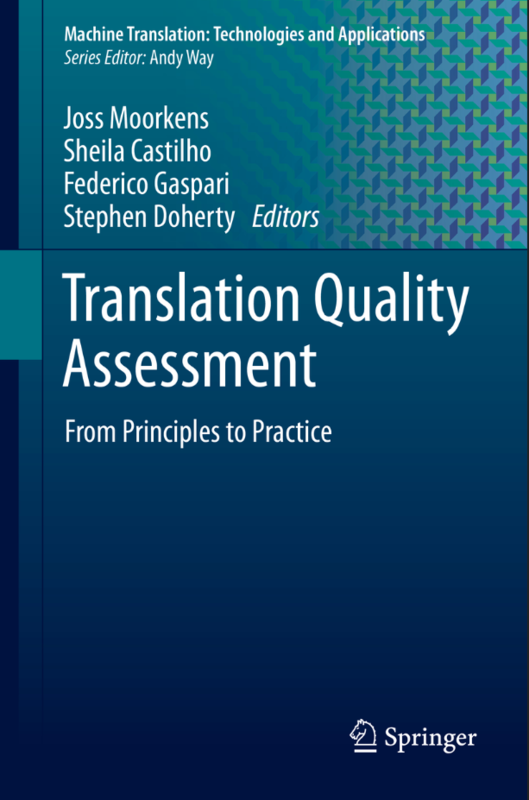 Ergonomics tries to tackle these cognitive, physical, organisational, and professional issues and sensitises us to the need for sustainable translation and interpreting practices. In this special issue of ITT, we seek to address a gap in translation and interpreting ergonomics. Hitherto, scant heed has been paid to trainer and trainee ergonomics in the fields of translation and interpreting. However, it stands to reason that, in order for aspiring translators and interpreters to cope with pressure, stress and competition in the future, sustainable practices have to be developed, taught and adopted within the confines of the classroom. Trainee ergonomics can provide the impetus to equip our students to meet current needs in the industry as well as those of the future. Trainer ergonomics also deserves attention because most of us, academics, struggle to manage our diverse responsibilities (teaching, researching, assessing, administering, and so on). In order to assure the quality of translator and interpreter training, a right balance must be sought and struck time and again, and new ways must be found to significantly speed up the abovementioned tasks and, thereby, alleviate the burdens thereof. In other words, this largely uncharted topic is particularly worthy of note, as trainer and trainee ergonomics can safely be said to be one of the master keys not only to future-proofing trainee translators and interpreters, but also to assuring educational quality in our domain. professional ergonomics and its effect on translator and/or interpreter training. Where are ergonomic problems encountered in translator and interpreter training? Which (technological or other) solutions to ergonomic problems are deemed most propitious in translator and interpreter training? Which solutions are effectively tested and meet the threshold of quality? We seek original, up-to-date, research-based contributions that do not exceed 8000 words (tables, captions, references, footnotes and endnotes included) and that reach out to an international readership. Although there is room for exploratory research, contributions that report on completed research will be given priority. All papers will be subject to double-blind peer review. The focus of all submissions should be in line with the ITT aims and scope. 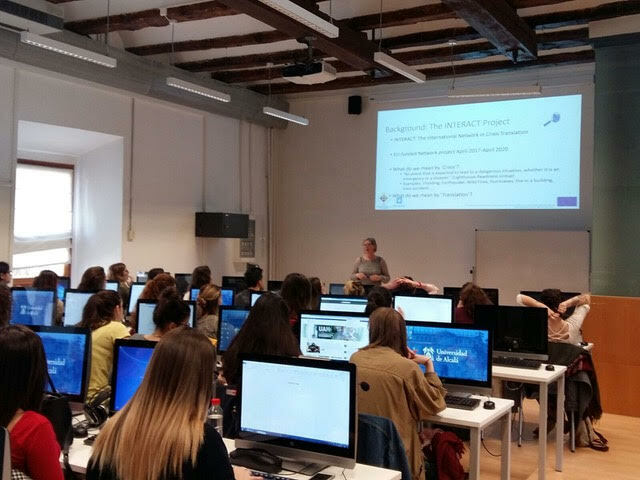 Dr Sharon O’Brien visited the University of Alcalá in Spain from 02-06 April where she gave a lecture to students on the topic of translation technology in crisis scenarios, a research seminar to staff and had several meetings with staff to discuss future research collaborations. 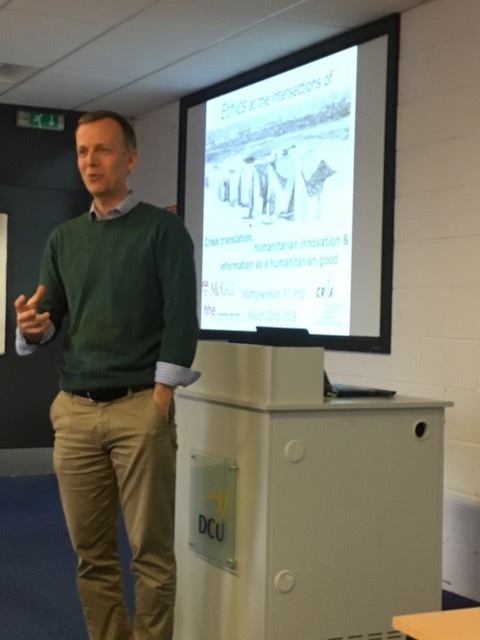 The INTERACT project and the Centre for Translation and Textual Studies at DCU had the good fortune to host a seminar by Dr Matthew Hunt on 22 March 2018. Matthew Hunt is an Associate Professor at McGill University in Montreal, Canada. A faculty member in the School of Physical and Occupational Therapy, he is also a researcher at the Centre for Interdisciplinary Research in Rehabilitation and associate member of the McGill Biomedical Ethics Unit and Institute for Health and Social Policy. 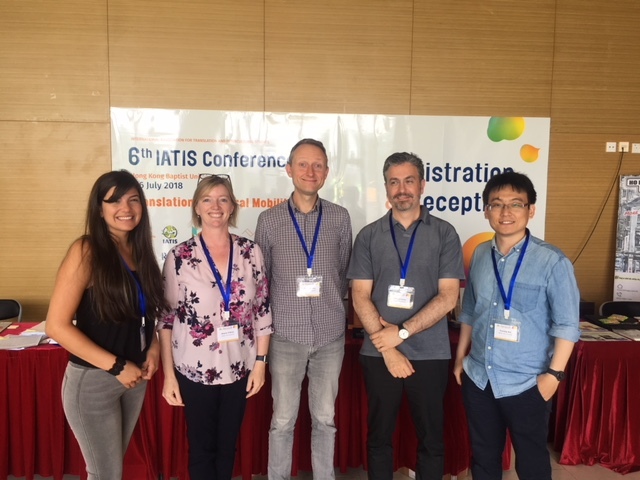 He presented some thought-provoking ideas about humanitarian innovation and how it might relate to translation, in general, and translation technology specifically. The talk was attended by DCU researchers from the School of Applied Language and Intercultural Studies, the School of Nursing and Human Science, the School of Computing, as well as colleagues from Deaf Studies at TCD. His visit to DCU was funded through the James M Flaherty Research Scholarship from the Ireland Canada University Foundation. 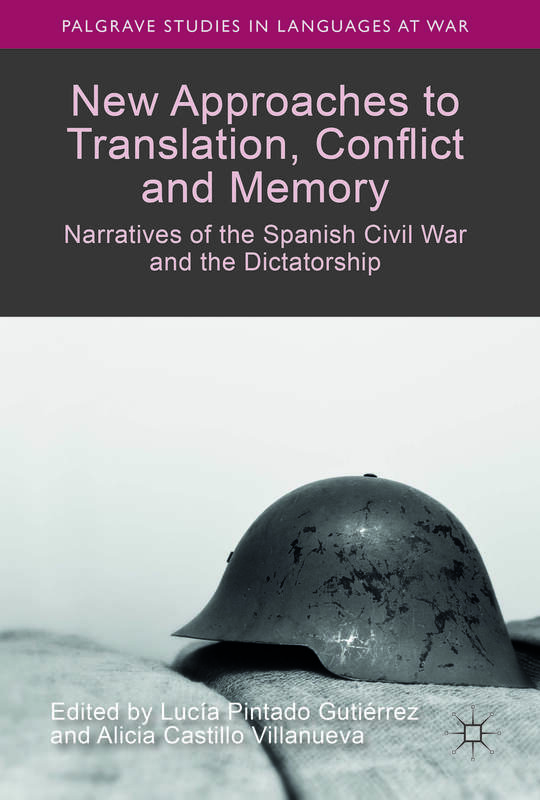 CFP – Special Issue of the Journal Perspectives: Narrative accounts of the Spanish Civil War and the Dictatorship at the crossroads of translation and memory studies. – Submission date for abstracts (no more than 500 words) and brief biography: 4th May 2018. – The editors will contact selected contributors by mid May 2018. – Completed articles, not longer than 7,000 words in English, are expected to be submitted by 30th November 2018.